If that’s true... Why did they even bother saying Q1 at the start? Does FFG really get “blindsided” for half a year by all the Legion they have to print? Just add one or two quarters to compensate so we don’t have to. Because that is the only reason why it could be delayed. It can't be because of any other reason at all. For whatever reason it may be delayed, this would be the second time in a row for a pretty scarce release schedule when other products are generally not encountering such issues. If you believe it’s not simply a matter of priorities, that’s fair and may be true. But personally, I would like to have seen FFG really make sure to announce a deadline they can actually meet given wave seven’s delay. I hope my complaints are proven wrong/moot and they do meet their deadline, or that it’s less late this time. It could be myriad of reasons. Tariffs, shipping container lost at sea (happens frequently), misprinting on a vital peice, ect. But if there is a delay, we now know why we got any news for Armada at all... because they had to know from the endless pestering that if no news had occured and we found out there had been a delay... well... it likely wouldnt have ended well. So there is a high likeliness of delay... I hope there isnt. @Ling27are you saying that the only reason we got the Sector Fleet rules is because there is a delay? As someone who did PR/PO for 6 years... its what I would have done. I would have given a little more... but its very possible. It is the first thing I thought when I saw Sector Fleet, though I prefer to remain positive. They could also have wanted to introduce the large scale rules for people to play with before getting the SSD, seeing as 2 of the SSD variants are for Sector Fleet play. Speaking of sector fleet play, I got an 800 point game in Friday. It was awesome! 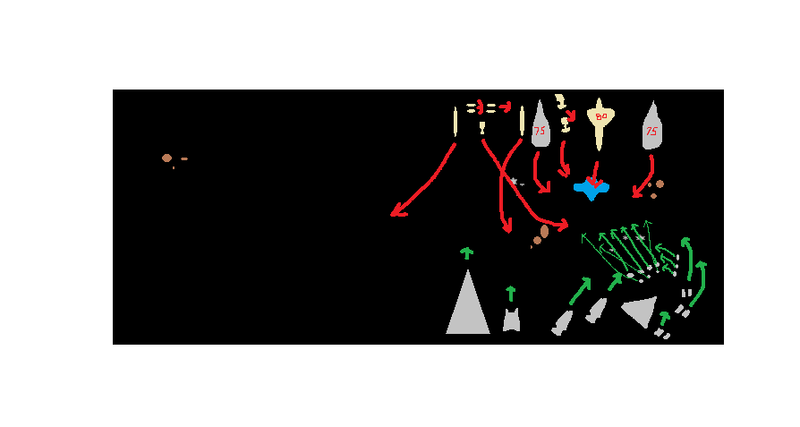 Rough sketch but our deployment was pretty much like this. (contested outpost). I ran my gozzers up the right side providing bomber command, slicer tool, and comms net support for my quasar while it pushed squads from just out of red range. My kittens formed a defensive line on the other side, broadsiding as needed. Demo and Devastator (ISD II) ran a slow approach up the left flank. My opponent was super aggressive with his Cr90 A and two mc30s, launching them speed 4 into the middle mat one mc30 and the cr90 diving in towards the cluster and the other mc30 swinging wide. His Hammerheads inched forward and the gr75s were providing comms net and leia support for the big ships. The liberty inched forward straight onto the objective while the two mc75s performed a pincer toward each other forming a defensive wall around the liberty. The first round kinda decided this one. He moved his CR90 and Mc30 too close too fast. Round 2 lost the cr90, round 3 lost an mc30 and a mc75. round 4 lost demo the other mc75 and the liberty. He called the match at this point. It was a really good game. Anyway, not strictly an article, but FFG confirmed on Twitter that the Rebel Fighter Squadrons are being reprinted "right NOW" - which I'm going to assume means the Imperial Fighter Squadrons are also being reprinted at the moment. I'm getting the feeling they've had some staff changes in the last few months, and the person in charge of the Upcoming page either isn't keeping track of things very well, or doesn't exist. Things like an upcoming page can be hard to keep up to date for various reasons. My office for the Army tried to keep such a thing going so our command could easily see what was happening in our print shop. But, between suprise missions to complete, and Secret stuff, we couldnt always keep it up to date. After about a year and a half of struggling with it, we dropped it. And part of that is the two guys who knew how to update it properly got deployed. So staff changes, new company policies regarding marketing, release schedules, local shipping regulations, ect. Could cause issues. At the same time the Twitter account has been a little more reactive than it seems it was a year ago. I am excited that the rebel fighters are getting their reprint. Ive been hoping to pick up a pack for my limited Rebel fleet. I want my SSD in a chocolate encased egg. Has to be dark chocolate. A Sith wouldn't have it any other way. They did feel like they came out of no where and highly reflected rules that already existed. but there are people that are happy with them and I'm just glad to see SOMETHING said about armada in general. I haven't actually played armada in almost 2 months now, pretty burned out. I'm sorry, but this isn't ok. They would be banned in the US because little kids would try to swallow them whole and choke to death. it's why we can't have kinder eggs either. It did "legitimize" the format a little, though. There seems to be a lot more interest in higher-point games now, which is exciting in and of itself. Oh man, the amount of trolling you can do to your allies. Player 1: geez, what a whiff. "While a friendly ship at distance 1-5 attacking a ship, it may discard 1 of its [Commander] or [Officer] cards (other than Darth Vader) to reroll any number of dice in its attack pool." No ally trolling possible. It is the friendly ship who gets to decide whether to discard a Commander or Officer to reroll its own dice, not the Darth Vader ship (unless they're the same). While thematically it may be that Darth Vader decides to "discard" someone to motivate the remaining crew, within the game it is the person who sacrifices themself to Darth Vader to do so. It's a Captain Needa situation, not an Admiral Ozzel one. You just don't need to shuttle across to apologise to Lord Vader in person. I'm humorously speaking of the chocolate only. I was in no way commenting on the ramifications of encasing a 24" plastic model inside an edible egg. Personally, younglings and some adults aren't allowed near my dark chocolate or my Armada collection. Yeah I'm going to be killing lots of "Skilled First Officers". 1 point reroll sacrifice. Skilled First officer gets orders to report to Raider. He thinks, "I'm getting promoted to Captain. There is no need for me on a Raider?!?" Finds out he isn't captain. Told to report to the forward guns of the SSD. He arrives and say to himself. "What the heck do they want me ackkkkk...." Vader walks in. If you do not hit that ship perfectly you will end up like this!" He doesn't even walk in. Poor guy gets a Skype call halfway through the battle and bites it in front of the whole gunnery team. That's how you know they're VETERAN gunners. They're all wearing masks so Vader can't identify and kill them individually.